HONG KONG, March 15, 2019-- Crypto.com, the pioneering payments and cryptocurrency platform, announced that its Crypto.com Chain Token (CRO) will be listed today on Upbit, a leading global digital asset exchange based in South Korea. The Crypto.com Chain is a high-performing public blockchain powering Crypto.com Pay, which allows customers to pay for goods and services with cryptocurrency while receiving generous cashback rewards. For merchants, Crypto.com Pay offers the option to get paid in any crypto without being exposed to its inherent volatility and enjoy greatly reduced processing fees and near instant settlement. 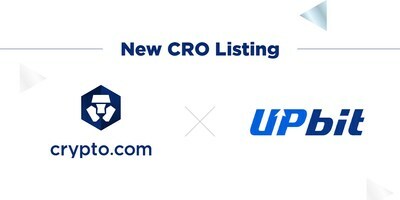 Kris Marszalek, Co-Founder and CEO of Crypto.com said, "We're thankful to Upbit for their support of our project. Our Chain team is on a tear recently – the Crypto.com Pay SDK shipped to merchant partners last week. On top of opening of the Pay platform to our 400,000 users this week, our team has scheduled to open-source the first version of Chain Testnet on Wednesday, March 20th as a part of a broader Dev Update. This is another milestone achieved ahead of schedule communicated in the CRO whitepaper." and operational know-how supporting the trade of more than 150 crypto-assets. Upbit provides financial-institution grade of security and user-friendly service from years of experience operating stock trading systems and is a partner of Bittrex, the premier US-based exchange.